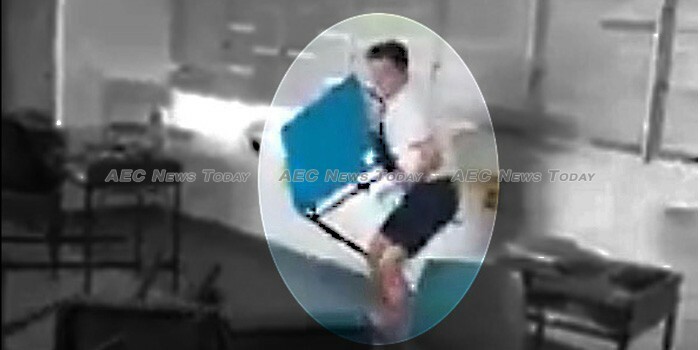 The offspring of well-heeled Singaporeans have been caught on video running amok at one of the country’s most prestigious schools. Far from an image of studious, youth intent on pursuing careers of excellence, the children in the video above exhibit the appearance of juvenile delinquents. As children scream, chairs and tables are hurled around the room with great ferocity, other items are smashed onto the floor. Bedlam ensues until another student enters and yells at the vandals. Quickly the chaotic scenes stops and the furniture is returned to its correct position. Shocked Singapore netizens quickly identified the school as the Anglo-Chinese School (ACS) Barker Road, with The New Paper saying the incident happened before the June holidays. A government-aided school that delivers a General Certificate of Secondary (GCE) ‘O’ Level Course for secondary students with the option to take a two-year International Baccalaureate diploma, ACS Barker Road is where well-off and affluent Singaporeans send their offspring (if they are bright enough) ahead of tertiary education at some of the world’s most exclusive institutions. Some Singaporean netizens described the wild scenes as ‘vandalism’, while others said it demonstrated the ‘privileged behaviour’ that some Singaporeans equate with wealth. Yet others said it reflected the general degradation of societal values, or was a hallmark of poor parenting. ACS Barker Road did not respond to an email requesting an explanation for the riotous behaviour captured in the video above, not as to what, if any, disciplinary measures had been imposed on the offenders. However, with behaviour such as in the video above we at AEC News Today can’t help thinking that rather institutions of higher learning, some of those above may be heading for stays in other kinds of ‘institutions’ when they get older, ones with the word ‘correctional’ in front of it. One Response to "Offspring of well-heeled Singaporeans trash ACS Barker road (video)"
acs barker road doesn’t not provide any IB or A level course after the 4 years of o levels/express track, you mean acs independent which provides IB after 4 years of express. Certainly, this shows that ACS barker isn’t a ‘prestigious’ school. The ‘prestigious’ school you mean is ACS independent which has rather strong discipline, you type acs independent you find good things about the school, you type acs barker, you find stories about the school’s poor discipline. Honestly, your news website is very poorly run as you fail to identify the CORRECT ACS school.